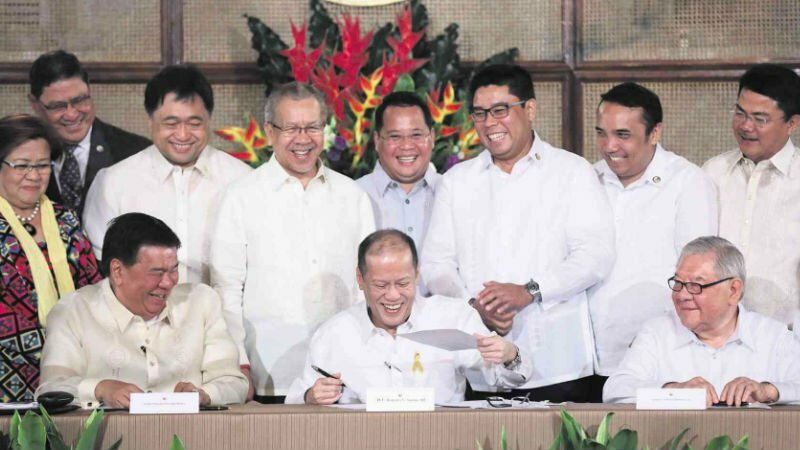 President Aquino on Tuesday signed two laws designed to be “game changers” in the country’s economy, with one seeking to curb cartels, price fixing and other forms of anticompetitive practices, and the other aimed at drastically lowering shipping costs. The President signed Republic Act No. 10667 (the Philippine Competition Act) and Republic Act No. 10668 (the Liberalized Cabotage Law) that would help ensure continued economic and inclusive growth. “Let me emphasize: If we will allow the old system to persist where there is no competition, we will be allowing our countrymen to suffer from paltry benefits. It will also be allowing ourselves to be content with a system where only a few will thrive,” Aquino said in a speech. He promised that the Philippine Competition Act and the Liberalized Cabotage Law would ensure the reforms his administration began would continue until the next generations. Speaker Feliciano Belmonte Jr. said the Philippine Competition Act was filed in the House of Representatives in the 8th Congress, or 26 years ago. The amendments to the Cabotage Law were proposed in the 11th Congress. “Signing into law these two game-changing legislations can truly help bring about inclusive growth … Thus we cannot end this administration without enacting a modern and comprehensive Competition Law and amending our Cabotage Law,” the Speaker added. Belmonte emphasized the need for the two laws with market integration of the Association of Southeast Asian Nations (Asean) underway. The economies of the 10-member Asean will start integration at the end of 2015, bringing down duties and nontariff barriers to create a single market to promote trade and investment. “We should promote competition for it brings about the greatest good for the greatest number of people which is the very essence of inclusive growth,” he said. The Competition Act would provide a level playing field that will ultimately lead to quality goods and services at competitive prices for the people, he said. The Competition Act will create a Philippine Competition Commission (PCC) under the Office of the President that will monitor, among other things, illegal methods that would kill market competition. The PCC can impose administrative fines of P100 million for the first offense and P250 million for the second offense for abuse of dominant position and prohibited merger. The amounts will be adjusted for inflation every five years. Offenders may also face up to seven years in prison. The amended Cabotage Law will allow foreign vessels from a foreign port to carry foreign cargo for import and export to its domestic port of final destination. “This will make the export and import of products faster and cheaper that will lead to a more vibrant market. Stakeholders, from consumers to businessmen, will be able to save (money),” the President said. He said that before the amended law, a cargo container from Cagayan de Oro going to Hong Kong would cost $1,264. Of the amount, $1,120 would be the cost from Cagayan de Oro to Manila and $144 from Manila to Hong Kong. “Because of the amended Cabotage Law, shippers from Cagayan de Oro can go straight to Hong Kong. They will pay only $500. They will be able to save $746 per container. Would you call it an absurd situation where the Philippines has one of the most expensive shipping costs when it has the third-, fourth-, or fifth-largest shipyard and where one-third or one-fourth of seafarers around the world come from?” Aquino said. Drilon said the amended Cabotage Law would allow foreign-flagged vessels to call at multiple ports, and enable importers and exporters to coload cargoes in foreign ships going in and out of the Philippines. Under the existing law, only domestic vessels are allowed to engage in coastwise trading, which involves carrying cargoes from one domestic port to another domestic port. The move will widen the market and is expected to lower the cost of transport of agricultural goods and other local produces, which ultimately affect prices of products sold to consumers, Drilon said. He added that without the amended Cabotage Law, local businessmen and consumers would continue to suffer from the high cost of domestic shipping, noting it is cheaper to transport cargo to another country’s port than from one local port to another. For instance, shipping dry cargo from Davao to Taiwan costs approximately $450 per 20-foot equivalent unit compared with $680 when shipped from Davao to Manila, Drilon noted. “By allowing foreign ships access to other ports in the country, the amendments will spur economic activity in these areas beyond Manila, and help free up space and decongest the Port of Manila, which before was the only place in the country where these foreign ships could load and off-load their cargo,” he said. A new competition law at last!